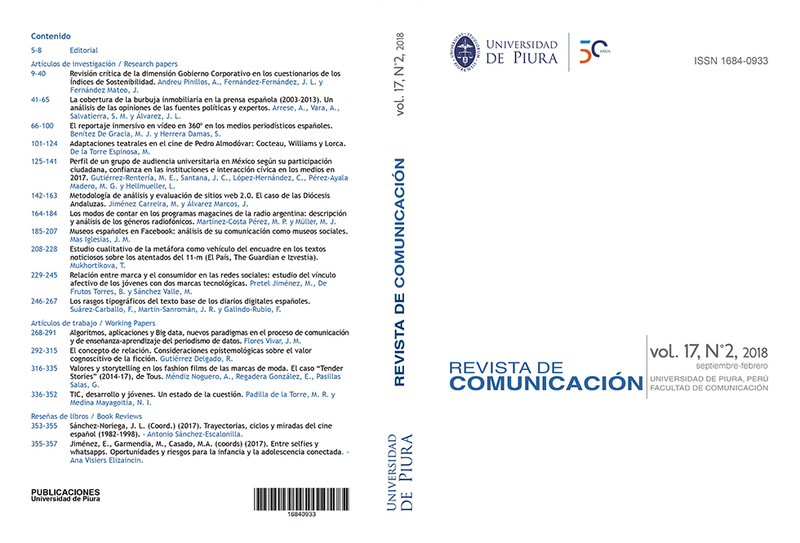 Revista de Comunicación is an academic publication of the Faculty of Communication of the University of Piura with a semiannual periodicity. Two issues are published per year in the months of March and September. • In general, those studies that deal with the different areas of the professional practice of communication: journalism, corporate and commercial communication, audiovisual communication, digital communication, etc. • Exploratory or descriptive works that establish new fields of research, or highlight important issues. • Studies that identify problems and provide opportunities for different topics related to the development of the profession. • Theoretical or conceptual works that introduce new perspectives, explanations or points of view in relation to a topic related to communication. - September 30, for the March. The magazine confirms the reception of articles within 3 days. The Editorial Committee will carry out an initial review of the received articles in order to ascertain whether they comply with the minimum quality requirements and are in line with the magazine profile. Revista de Comunicación only publishes manuscripts that have not previously been published and wich receive a favourable evaluation from two external reviewers outside Universidad de Piura, experts in the subject matter. During the review period, the author and reviewers shall remain anonymous. If the two evaluations received about an original manuscript contradict one another, Revista de Comunicación will turn to a third external reviewer. Once the concepts of external academic peers are received, a decision is made, which can be acceptance with adjustments, final acceptance or rejection. The journal undertakes to communicate to the authors the positive or negative decision on the publication of their papers in the 10-th week after the closing date of each edition. The communication will be accompanied by the content of the anonymous reports of the external evaluators. If the article is approved with modifications, the author/s have a three week period to incorporate the changes. Then the editor, along with external evaluators, will verify that these changes have been made. If so, the manuscript will be valued as concluded. If not, will be dismissed. Accepting the articles and making the adjustments and the precisions to which they occur, these pass to orthographic correction, in which process the particular style of each author is respected. This correction is of form, never of content. The communication is direct with the authors, not to alter the original contents. If within the stipulated period the author does not resolve doubts or corrections, his article will be published in another edition, until the doubts or suggestions have been fully resolved. Prior to the publication of the journal issue, the articles will be available with their corresponding DOI in the web of the Revista de Comunicación. All articles must be original. They can be written in Spanish or English. They must be sent to e-mail magazine: rcom@udep.pe. The author is responsible for the authorship of the manuscript in the event of conflict with previously published articles. The author will send, with the article, the Declaration of Originality, signed by all co-authors, if applicable. The maximum number of authors per article is three. If the manuscript is linked to a research project in which more people have taken part, the other collaborators should be indicated in a footnote. Revista de Comunicación recommends the citation of scientific publications from the field of journalism, audiovisual communication and advertising. • Research papers: Academic material that presents, in detail, the original results of research projects. The structure of the article should approximate the following format: introduction; theoretical framework and / or literature review; methodology; results; discussion; conclusions; bibliographic references..
• Working papers: Dissemination academic material, oriented to the identification of problems in the profession and its possible solutions, as well as studies that introduce new fields of work, which usually requires an early diffusion. The structure should be approached in the following format: introduction; development; argumentation; conclusions; bibliographic references..
• Book reviews of recent publications in the field of communication. Those interested in publishing must respect the proposed rules indicates at the Style Guidelines. The editor, along with his associate editors, coordinates the editorial process. Members of the Editorial Advisory Board also participate, when required, in this process to guarantee the journal's quality standards. Principa professor of the Faculty of Communication. She is part of the editorial board of the magazines Mercurio Peruano and Journal of Spanish Language Media. Collaborates as external evaluator with scientific magazines Comunicación&Sociedad, Palabra Clave, y Cuadernos Info. Ordinary associate professor of the Faculty of Communication. She is part of the Scientific Committee of the International Congress of Cyberjournalism (University of Porto), IAMRC conferences and the editorial board of the journals Vivat Académia and Comunife. Collaborates as external evaluator with academical journals Cuadernos Info and Media and Communication. Full Professor of Journalism. She obtained the Extraordinary Doctorate Award. She is the author of 3 books and more than 50 articles published in prestigious academic journals. He is Visiting Researcher of the University of Ottawa (Canada) and University of Texas in Austin (United States). Ordinary associate professor of the Faculty of Communication. He is part of the Research Council of the University of Piura and is the author of nine books and several articles published in prestigious academic journals. Highlighted with Second Place in the National Contest "University Book", National Photography Prize, among others.